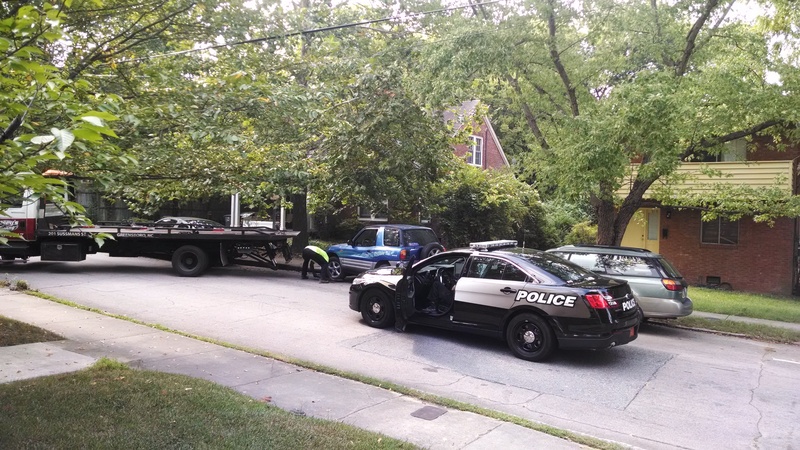 A tow truck driver hooks up a RAV4 that was blocking a driveway on Carr Street this morning. Note to sovereign citizens and others who would leave their clumsily parked cars blocking driveways: The parking laws don’t bend that far. And if you’re a Libertarian looking for your RAV4 today, check with the police. A blue RAV4 with a Ron Paul for President bumper sticker was parked blocking the driveway at 919 Carr Street this morning. The passenger-side tires were actually up into the driveway — must have been a rough night. And it must have been a slow morning for crime in Greensboro. Two police cars showed up and had that thing yanked out of there in no time flat. This entry was posted in Alerts, Carr Street. Bookmark the permalink.